There are plenty of reasons to live tiny; here are some tips for making the most out of a small living space! The average apartment size has been shrinking dramatically in the recent years, with average sizes ranging from 750 square feet to 982 square feet in metropolitan cities such as Seattle, Dallas, Houston, and New York. Nationals from many Asian nations may think that amount of space is still nothing to snort at, as North American living spaces are quite often the largest in the world. Even at the smallest average apartment size which is teetering around 700 square feet, it’s almost double that of a Hong Kong Micro Apartment, which averages at around 300 – 400 square feet. With space constraints of any nature, a few smart furniture or appliance purchases can go a long way. There is a whole counter-culture surrounding living “tiny” called “tiny house living”. Smaller homes, often many in used shipping containers; tiny houses often borrow from bars and yachts to get equipment such as sinks, taps and toilets that fit just right. Having a smaller-scale sofa will still provide the luxurious comfort of a full size sofa without the space consumption. And going small-scale does not mean you need to skimp on the decor. Small can still be attractive and comfortable without limiting your selection. An expanding table is ideal for smaller homes where you can still enjoy the flexibility of having a full house for dinner with friends and family. You can also get coffee tables which can rise up to “normal” table height. Custom furniture is an ideal investment for smaller spaces, and it typically ages much better as well. So, how small are we talking here? Bachelor pad small? Single room small? No room for laundry facilities, small? Well, then these are for you. We’ve assembled a list of clothes-cleaning options for small spaces. This pedal powered clothes washer uses zero electricity and can clean laundry around a kilo at a time. Perfect for the wandering hobos, dorm-room dwellers, and tiny house people alike! Daewoo makes a pretty snazzy iMac circa early 2000’s-looking wall mounted washer drum. Pretty neat, indeed. This little gem is an electric dryer that’s ideal for a small apartment and packs a warranty. No more having to leave your apartment to dry your clothes. A marine stove can be a great cooking solution for a small living space. Not only can it help you cook, it can also lower your heating bill. Yacht and other marine accessories and appliances are typically safe, durable, and easy to install. Not every piece of furniture for smaller spaces have to be customized. There are a number of prefabricated multi-use furniture concepts on the market, from beds that fold out of walls, to sofas that turn into desks, there are plenty of options available. Many of the examples we found online can save you hundreds of square feet. Cabinets can free up a lot of space and are specifically valuable in small apartments with tall ceilings. 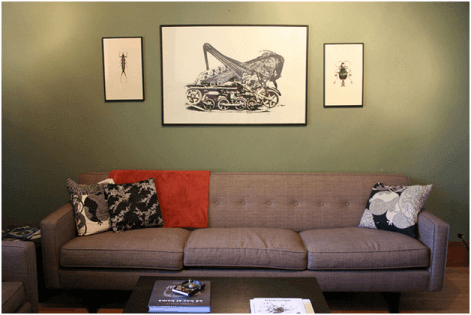 There’s a lot of unused wall space around if you simply know where to look. Cabinets can go high overhead, below stairs, tables, over windows and under counters.